Over the past two years, Novak Djokovic has beaten Andy Murray so many times that it is very difficult to figure out how the Brit can stun him. Without a doubt, Murray has been somewhat close at times, but last year, Djokovic was stronger, faster and overpowered him. In 2014, Djokovic beat Murray in four contests, including the US Open quarters, when he pushed him back in four sets. Yes, in the fall in 2013, Murray was hurt and it took him a while to come back. So, in a sense, you can toss 2014 out the window. In 2015, Murray felt much better physically and he was ready to go. However, when he walked on court, Murray knew he had to show something different, meaning he had to wear him down clubbing his forehands and backhands very deep, he had to nail his first serves, and he had to come into the net and put thenaway when Djokovic was way back of the court. But he could not. Yes, Murray would win a few sets, but the longer it went, it was harder and harder to be super accurate. That is why Murray lost six out of seven matches in 2015, losing the Australia Open in the final 7-6(5) 6-7(4) 6-3 6-0, and in the semi at Roland Garros, he went down 6-3 6-3 5-7 5-7 6-1. Was it really close at the majors? Not really, because he wasn’t on the finish line. Djokovic played nearly perfectly to beat Roger Federer in the semis. He knows that if he is accurate and can go side to side, he will win the majority of his shots. The Serbian has a cialis generique better forehand, his serves and his returns, even though Murray has an incredible return, too. 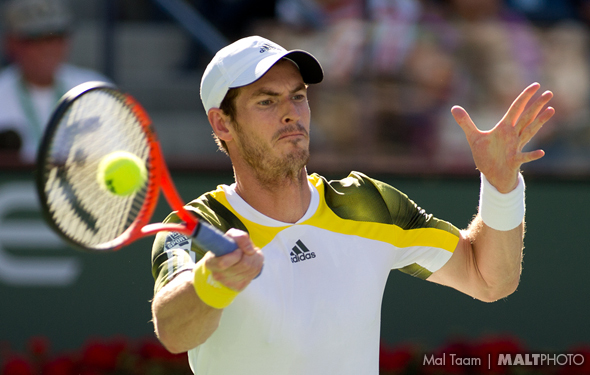 They are even with their famous backhand, and perhaps Murray is more comfortable at the net. On Saturday, Angie Kerber shocked the great Serena Williams to win the title. Without a doubt, Murray can stun Djokovic, as in the 2012 US Open final, the Brit ran the Serbian down and won in five glorious sets. But that was a long time ago and Djokovic knows how to play. Novak will win his sixth Australian Open in five fun sets. The Aussie women final: Does Kerber have a chance vs Serena? Let’s think of some positives of Angie Kerber, even though she is a serious underdog against Serena Williams in the final at the Australian Open. While the German has only beaten her once, back in 2012 Cincinnati, she wasn’t afraid, she went for it and Serena was a little out of it. Head to head, Serena is 5-1 versus Kerber, but the last time they played in the final at 2014 Stanford, it was pretty close, with Serena winning 7-6 6-3. Kerber has become extremely nervous at the majors, but at the other tournaments, she can dig in and go side to side until she cracks them. Kerber has never reached the Grand Slam final before, so when she walks on court, her head could start swimming around. She says that she knows that she is the underdog and she knows that, so she needs to start very quickly and rapidly. She realizes that Serena is far better when she is crushing her first serve, so anytime Williams needs to make a second serve, Kerber has to swing as hard as she can and levitra cost cvs nail it very deep. On the baseline and between their strokes, they are pretty close, but even though the German is very strong, she isn’t quite as powerful with her forehand. The second that Serena sees the ball is coming up short, she will pounce on it. Sure, Kerber can play forever, and she loves to engage long rallies, but Serena isn’t going to want to wait from way behind the back. Once Serena has an opportunity to strike, she will judge on it. Kerber can hit down the line and go crosscourt very smartly. She might be a little faster, but so what? Kerber has to nail big serves and returns, but against the American, she will overpowering her. As the Canadian said, this is an entirely new look. They did play last spring in May on Madrid, but Raonic was already hurt and he couldn’t move around as fast as he normally could. 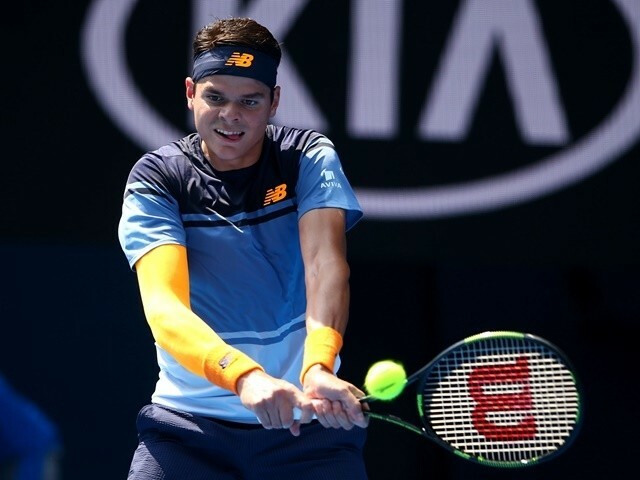 When Murray was able to yank him around, the 25-year-old Raonic was unable to smack the balls very hard or deep. He went down in straight sets and then he was gone, undergoing his surgery and even when he returned into the grass, he was flat and unsure of himself. But during the past three weeks, he has been incredibly confident. Before he even started in Brisbane, Raonic said he could win a major for the first time this year. That was surprising, because he had only reached at a Grand Slam semifinal at 2014 Wimbledon, and while he has won a couple big ATP tournaments, he hadn’t shown that he could consistently knock off the big boys. But in Brisbane, he took down Roger Federer in the final, crushing his serve, coming into the net, and nailing his forehand. Here in Melbourne, he did much the same thing, being ultra-aggressive against Stan Wawrinka and not allowing the Swiss to mix it up or disturb him. Raonic was under control. But now, Raonic has to be a little patient and not go crazy if Murray keeps pushing him backwards. Without a doubt, the Brit has a substantially better backhand and can put it anywhere he wants. Raonic’s forehand is bigger, but that doesn’t mean that Murray can return pretty deep and overcook him. The Canadian must come into the net as often as possible, but he has to fool him rather than telling him where he is going because Murray is extremely smart and he knows that if he can hit the balls low and try to touch his toes, then Raonic will be frustrated when trying to dig out the passing shots. What we do know is that Murray manages to return deep shots even though his opponents are crushing their first serves and he isn’t effected by it. The 28-year-old Murray loves playing tennis, watching it, paying attention to it and reading it. He has won two Grand Slams (the 2012 US Open and the 2013 Wimbledon) and the 2012 Olympic Gold, and he has reached his 18th Grand Slam semis, which mean that he is always right there. 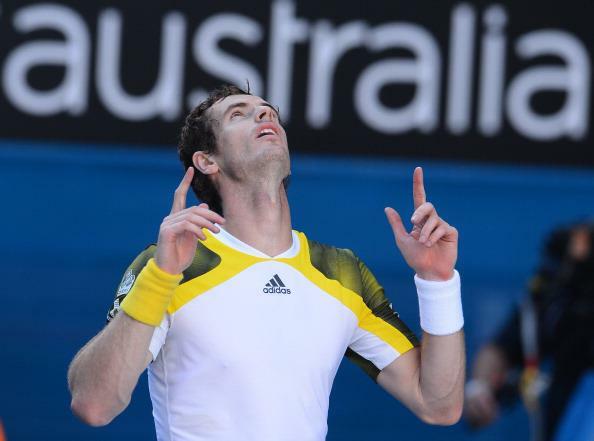 He has reached the Australian Open six times in the semis, beating Marin Cilic, David Ferrer, Federer and Tomas Berdych. Unfortunately, he has yet to win the final at the Aussie Open, but this is only the semi so mentally, he won’t be afraid at all. However, it’s time for Raonic to truly realize his potential. Murray will try a million tricks, but in the end, Raonic will out him and win in five dramatic sets. Here we go again: Can Federer stop Djokovic at Aussie Open? Novak Djokovic is the world’s best player everywhere he goes, so despite the fact that the 17-time Grand Slam Roger Federer can beat anyone on a great day, that does not mean that he has been able to stop the Serbian on the hard courts at a Slam since 2009. Yes, since that time, Federer has beaten Djokovic numerous times at various tournaments in two-out-of-three on the hard courts, but that is not the same of three-out-of-five sets. At the 2009 US Open semifinal at the Arthur Ashe Stadium, when Djokovic was still learning to play, Federer raced around on the somewhat slick surface and won 7-6 7-5 7-5. But in 2010, Djokovic knocked him out in a classic semifinal at the US Open, fighting back a match point with a huge forehand to win 7-5 in the fifth. At the 2011 Australian Open on the hard courts once again, Djokovic out-schooled him 7-6 7-5 6-4. At the 2011 US Open, they did the exactly same thing, running past Federer 7-5 in the fifth. The Swiss was fairly upset, to say the least. After that, they faced off plenty of times, on the clay, on the grass and on the hard courts, but it wasn’t until the 2016 US Open final, when they finally would clash on the beloved hard courts. Federer had just beaten Djokovic in the Cincinnati final in the two-out-of-three. 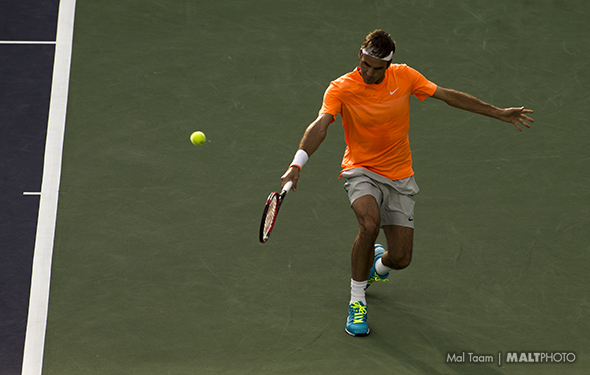 In New York, Federer was ready to dance, but oops, he went down again, this time in four sets. In three-out-of-five, you cannot hide. It is raining outside, which means on Thursday night, the roof will be closed and the court will be a bit slower – unless the sun come out and the roof will be opened up. Is Djokovic a little faster? Yes, the 28-year-old is a little quicker than the 34-year-old, so when he’s stretched way out, he still manages to dig it out and find with lines, even when Federer has already attacked the net. Djokovic has significantly improved his forehand and serve over the years, but Federer has improved, too, and he certainly can out-hit him forehand to forehand. But then again, the two-hand backhand Serbian can blow him apart corner to corner. On the serve, both of them can dominate the box, going wide, into the chest, or on the T. Federer has so many different types of shots: he can chop his backhand, he can roll it over, and he can flat it out. While Djokovic is steadier with his forehand and his backhand, he can twist it around: he can spin heavily, he can move forward like lightning, and he doesn’t mind to chuck in a few drop shots. Without a doubt, many people are thinking that if Federer goes into the net, that he can unearth Djokovic. But in the 2015 US Open final, the Swiss was unable to go to the net all the time and bother him. Djokovic knew that he was coming and he passed time and time again. It was a fine idea from Federer, but he could trouble him. That is what will occur tonight on Thursday on Rod Laver. Yes, Federer has played extremely well in the last 10 days, but this is an entire different match up. They have played each other 44 times, which is incredible, and they are locked 22-22. The No.1 Djokovic was pretty shaky to over come Gilles Simon in five sets. He was not perfect in defeating Kei Nishikori, but he was very smart and he did. Now, he is ready to jump on Federer. While Federer will change his tactics a little bit, it is not going to radically change on a hard court it the Australian Open. Djokovic believes he is in control and he will win in four sets. Is there anyway that Aga Radwanska can trick Serena Williams, given that she lost to her eight times in a row? Not really, but at least she has reached the semifinals and, if she can get her teeth in, maybe she can bother her and begin to believe that she can actually win the match. Back in 2012 in the Wimbledon final against Williams, Radwanska was spinning around, mixing it up, coming forward, back and forth and painting the line. They were locked up. They had split their two sets and it was 2-2 in the third. But then Serena calmed down, she took her time, she blasted some huge serves, she returned aggressively and she decided that she wasn’t going to scramble around. Radwanska fought, but she was merely hoping that Serena would happen to fail and she would win her first major. The only way that Radwanska was going to win was to risk it. She didn’t and she was gone 6-1 5-7 6-2. Since then, Aga wasn’t really closed. 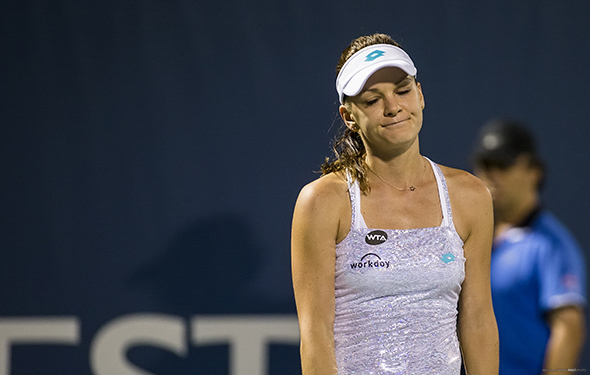 In 2013 in Toronto, she looked pretty spry, her backhand was lethal and she really hustled, but the incredibly creative Radwanska fell 7-6(3) 6-4. She couldn’t break Serena down. The 34-year-old Serena has said that she and Radwanska are now getting along off the court. That is very good, but that does not mean that the American will let her guard down. Serena also gets along well with Caro Wozniacki and Vika Azarenka, but she has still managed to beat them soundly, so that is not going to give her some slack. No, Radwanska is going to have to play as well as she can – even better. She is going to have to add a lot of speed on her first and second serve. She is going to yank Serena side-to-side with her backhand and forehand and come into the net whenever she can attack a short ball. Somehow, when Serena is blasting gigantic serves, she has to discover where she is going and pop it back very deep. If Radwanska manages to do that, she will have an opportunity, but Serena is playing fantastic ball once again. In the quarters against Maria Sharapova, she knew that she had to be incredibly explosive and that is exactly what she did. We all know that Serena hiccupped in the semis against Roberta Vinci when she fell. This time, she won’t be as anxious. Before the tournament I thought Aga would win the trophy. Then, I though Serena was hurt. But now she is not. Serena will win in three, tough, fun sets. Clearly, Kerber woke up and smelled the roses to upset Azarenka, the favorite. Instead of pushing back, the German moved forward and cracked her much improved forehand. The lefty can sprint for hours, she can bend very low and bomb her backhand, and she can be pretty comfortable at the net. Last year, the soon-to-be top 5 player won four titles, but she wasn’t able to reach the second week at any of the majors. This week, she decided she could really go for it and she did. Now the 28-year-old Kerber is the favorite against the British Konta, who has reached the final four since the now-broadcaster Sue Barker did it 40 years ago. The 25-year-old Konta has really come out of nowhere. At the beginning of last year, she was ranked No. 147. She played a ton of US and Canadian challengers, rose up at the US Open and played tremendous ball at Wuhan and generic levitra faq uk Linz. In 2016, she was already to go and during the past 10 days, she has been consistently striking the ball. She is more powerful and directed and she rarely grows tired. However, she is not quiet there yet. Yes, she can bang it from the backcourt, but Kerber has more savvy. The German will win in straight sets to reach the final for the first time. Can the Spaniard really bother the Brit if he manages to serve big and jump on his returns? Maybe, but even if he does, how is he going to wear him down? Years ago, Ferrer did, as he could run side to side, pushed him back for hours, and Murray became frustrated. Instead of being patient, he could be wild. But over the past few years, Murray improved overall. His forehand is stronger, especially when he goes down the line. His brilliant backhand is so sharp and he can smack it were ever he want to. Ferrer can’t find a way to crack him, and now he has become anxious. Both the veterans know each other well, with Murray having beaten him 15 times, and Ferrer has won six times. According to Murray, he has found out that Ferrer has recently changed his racket and now he can hit even harder. Perhaps he is, but that doesn’t mean he can out–hit him, as Murray has looked fantastic since he arrived here last week. Murray will win in the four sets. Monfils’ right arm must be busted up after he dove to the right to try to hit a forehand and fell hard into the court. He said that he could have broken it, but it didn’t. However, he is likely pretty sore and while he can leap around and crush his first serve and forehand, he can be erratic and he has never gone deep at the Aussie Open. However, the 29-year-old Frenchman has beaten Raonic twice and, while it was a while ago, at least he will think he can sting him. On Rod Laver, he can smile and grin and have the fans join him in a fun match. However, Raonic has played extremely well since he started this year in Brisbane. He knocked out Roger Federer in the final, and here, when Stan Wawrinka was trying to trick him, he decided to be more aggressive in his serve, returns and net game. Monfils can sit way back and punch the ball around, but Raonic has no intention to engage in long rallies. He will swing early and often and the Canadian will win in straight sets. Do we have to see this again? In two-and-a-half weeks ago in the final of Brisbane, Azarenka beat the heck out of Kerber 6-3 6-1. The first set wasn’t bad, but after that, Azarenka whacked her. She has never lost against Kerber, who she has beaten six times, and the reason is because her serve is substantially better. In big matches, she can get right into her face and the German backs off. Look, Kerber is an excellent player when she is feeling fantastic mentally and outside her so-so serve (and it can be very, very bad), she can handle anyone. She is a super fast, she doesn’t get tired and she can paste her forehand and backhand. At the 2015 US Open, Kerber was very close of upsetting Azarenka, but lost 6-4 in the third. Azarenka was pretty vulnerable then but now, the former two-time Aussie champion is on fire and hasn’t lost a set. She will be ultra aggressive and come to the net whenever she can. Azarenka will win in two sets. What a shocker that they both reached the quarters. Who would have think it? Konta has played extremely well over the past six months; while Shang has lost time and time again. She said that she was ready to retire, but then she qualified and began ripping the ball from everywhere. It’s a true pic-em. I will take Zhang, largely because she knocked a series of fine players (even if they were hurt) such as Simone Halep, Alize Cornet, Varvara Lepchenko and Madison Keys. Zhang Zhang will win in three very tough sets. Another classic? Serena Williams vs Maria Sharapova: who will win? The fabulous Serena is now rolling again, hitting huge serve, cracking her returns and pounding her strokes. The American is directive and showed the young Russian that she has a very long way to go. She is the favorite, but against Maria Sharapova she will have to play consistent and calm. The Russian-American says that the young Swiss is already very good and she wouldn’t back off. In a fine match, Sharapova served gigantic, and managed to go for it consistently when she wanted to go down the line and fool her opponent. Sharapova said that clearly, Bencic is already one of the best players in the game. But she isn’t beating her yet. In 2004, Sharapova was only 17-year-old, and she had no fear at all, out hitting Serena at the Wimbledon final and the WTA Finals. She was able to hit the lines off both wings. After Serena upended Sharapova in the 2005 Australian Open in the semis when Maria had a match point but was unable to nail it, it totally changed. Since then, Serena has won 17 matches in a row and Maria has only been able to win three sets. Serena has beaten her everywhere, by returning substantially better, and smoking her serves that Sharapova cannot handle. Once they get into rallies, it is pretty darn close, but Maria cannot seem to read her, while Serena usually knows which way she is going. Yes, Sharapova has improved with her drop shots, and yes, on occasion now, she will come into the net, but if Serena is crushing her serves and she is leaping on her returns, then how exactly is Maria going to win lengthy points? That would be extraordinary. Without a doubt, Sharapova really does want to find away to upset Serena and she will try super hard. But in the end, Williams will find the lines once again. Serena will win in three terrific sets. The German was right there, up 5-2 in the third set, but then her left leg started to cramp and she was crying, not able to run very fast anymore. Radwanska escaped and she continued to fight. However, she is going to have to play much better if she wants to win the title for the first time. Good for Suarez Navarro for waking up, seized the moment and has reached the quarters. She may not be tall, but she is very muscular and strong. However, even though Radwanska was spotty on Sunday, at least she knows how to play her. Without a doubt, they will contest long rallies, and given that Suarez Navarro edged her 6-4 in the third in Miami last year, there is no doubt that the Spaniard will trouble her by exposing her forehand. However, the Pole can mix it up more often and she will seize the moment. Radwanska will win in three sets. Clearly, the Serbian didn’t play very well, but in the fifth set, he moved forward, he took some risks and believed that when he had to push and shove, he did it, out-hitting the steady Simon. Now, Djokovic can breathe, but will he back off and try to be a little bit more consistent? Perhaps he will, but he’s so good that he can frequently change his direction and when he is feeling right, he can crack it anywhere he wants to. The Japanese is very pleased that he trounced the Frenchman who took him down in five sets in the quarters of the Roland Garros. He jumped in the returns and yanked him from side to side. The 25-year-old thinks he has a real shot to win the tournament. He still has to prove it. The Japanese says that he is ready to beat the Serbian again, having stunned him at the 2014 US Open semifinal. But after that, Djokovic has ripped him four times in a row. He is taller, stronger and smarter. Yes, Nishikori is a little faster, but he cannot out-hit him from the backcourts. Without a doubt, Nishikori can be super aggressive, but Djokovic has to still be a little angry from playing down to Simon’s level. This time, he won’t and dictate his own turns. Djokovic will win in four sets. The Swiss was delightful, out-stroking with his forehand, backhand and volleys. He was moving forward all the time, knowing that wherever he was, he believed that his shot was substantially stronger and smarter. That’s why the 17-time Grand Slam champion crushed the Belgian. It was very surprising that the 27-year-old Spaniard was very close against the Czech given that he has never gone deep at the Slams, but Bautista was right there and had he not hiccupped, he might have stunned Berdych. However, Berdych has been around for a long time and rarely falls against the top 30 boys. Berdych wants another shot against Federer and if he plays spectacularly well, he can chop him out. The Czech had stunned Federer at the 2010 Wimbledon semis and at the 2012 US Open quarterfinal, but Federer has beaten him 15 other times, including twice at the Australian Open. Moreover, ‘Rog’ beat him three times last year, including the ATP Finals. Federer says that the court is quick, and big Berdych likes to keep the points short. However, even if that’s true, Berdych hasn’t looked fantastic. Federer has been dancing on the streets. He will win in straight sets. AUSTRALIAN OPEN, JAN. 23, 2016 – In a flash amongst the men, most of the young males were gone. At the WTA, a number of top competitors left quickly, but on Friday, the elder ATP folks look very good, and very intelligent. The somewhat unbeatable Novak Djokovic dusted Andreas Seppi. 6-1 7-5 7-6(6) and he will face the savvy Gilles Simon who crushed Federico Delbonis 6-3 6-2 6-1. These two have faced off 10 times, with the Frenchman winning the first time they played, in 2008 Marseille, but after that, the Serbian got better and better and gained experience. Simon can be fast, he can be powerful and he can cagey, but is he strong enough to out-him? That is doubtful, given that the No. 1 may not be having a great day, and still, he’s winning just about every single set. “You try to keep it very simple. When the tough gets going, you try to dig out what’s in you,” Djokovic said. 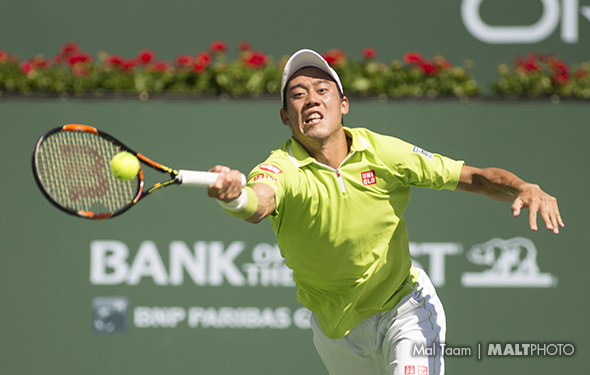 It looked like Kei Nishikori was hurt again – and really, he gets hurt all the time – but he turned it around. He didn’t think his sore wrist was bothering him and he looked terrific to win it 7-5 2-6 6-3 6-4 over Guillermo Garcia-Lopez. Now he has to face Jo-Wilfried Tsonga,who beat Pierre-Hugues Herbert 6-4 7-6(7) 7-6(4). That will be a huge match, considering that Tsonga overcame Nishikori in five sets in the quarters at the 2015 Roland Garros. The Japanese journos are still talking about it because Kei was right there. He freezed up. Now he has another gigantic chance. If he doesn’t immediately attack, then the Frenchman will climb on top and beat him down. It’s time for the 25-year-old to step up and not hesitate. In a sense it was too bad that Grigor Dimitrov couldn’t manage to claw into the fifth sildenafil 100 mg set against the great Roger Federer. But it wasn’t to be. Over the past three weeks, Dimitrov has played a little better, but not enough, as the Swiss is much more consistent, his serve is superior and on court he is smarter, too. Federer took it 6-4 3-6 6-1 6-4 and later said that the younger players aren’t patient enough. Dimitrov is 24 years old now so his time is now, but as Federer said, the teenagers have a long way to go. Federer will go up against David Goffin, who skipped around and bested Dominic Thiem in four sets. Goffin will have a great time running around and try to mix up his attack, but he isn’t strong enough to topple the creative Federer. It sure looks like Federer will reach to the semis, assuming he’s shocked by the Belgium, but it’s likely that he will go up against the well-known Tomas Berdych. The tall Czech played very well and he was composed to beat Nick Kyrgios 6-3 6-4 1-6 6-4. The 20-year-old was disappointing because he really thought he was ready to go far at the Slam, but he didn’t. Kyrgios is tall, athletic and he is reasonably intelligent, but he still has to be more on top of the ball. He can belt his first serves, but his second serve can be so-so and his return can be spotty. But if he continues to work Kyrgios will get better and better. Look at the 30-year-old Berdych now: he is not just blasting away, but he will be patient until he can set up the right way and then blast it. That is exactly what the Aussie needs to do. Berdych didn’t have a terrific 2015, but maybe he is ready to finally win a major. He will face the red-hot Roberto Bautista Agut, who upset Marin Cilic 6-4 7-6(5) 7-5. On Saturday in the bottom half, all the bigger seeds won, including Andy Murray, Stan Wawrinka, David Ferrer, John Isner, Milos Raonic and Gael Monfils. Wawrinka will face Raonic, with the Swiss having beaten him all four times they have played. Ferrer has beaten Isner six out of seven times. Clearly, they are both the underdogs, but at this point they need to win right now. Ferrer has been around forever as he is still very good and never backs off. Wawrinka, who has now won two Slams, has been substantially better over the past three years. If either Isner or Raonic don’t change it up, they will lose. If they give them a few tricks, then maybe they can unearth them. Monfils has been out hurt seemingly forever, but now the Frenchman is back and when he is happy and feeling good. When healthy, he can be phenomenal. He will face the Russian Andrey Kuznetsov, who looked driven and beat Dudi Sela 7-5 3-6 6-1 7-6(4). AUSTRALIAN OPEN, DAY 4, JAN. 21, 2016 – Ana Ivanovic has been around a long time now, so long that the 28-year-old is now one of the respected statements. Since she won her first Grand Slam – her only major title – she has been very good at times, and at other times, very bad. Now, she has reached the third round, which is pretty good, but at this point, the Serbian has to go super deep in order to satisfy herself. Once you win a major, like she did when she won the 2008 Roland Garros title and became No. 1, she wante to stay there. She wanted to win more Grand Slams at the other three. In 2007 and the first half of 2008, she was on fire, reaching the final of the Australian Open, but lost to Maria Sharapova in a hard-fought match. But she hasn’t been able to find her way to the finals again, largely because she will panic when she is so close to the finish line. However, Ivanovic continues to battle and changing up her tactics, and the always-happy person hasn’t given up yet. Every 10 years, the players change. Even though Serena Williams is dominating now, many of the very good veterans realize that the youngsters aren’t afraid and many of them are more effective. And they can attack early, too. On Thursday, Ivanovic beat the Latvian Anastasija Sevastova 6-3 6-3. It was competitive. Zhang Shuai of China beat Alize Cornet 6-3 6-3; Denisa Allertova of the Czech Republic bested Sabine Lisicki 6-3 2-6 6-4; and Naomi Osaka of Japan beat another youngster Elina Svitolina 6-4 6-4. Who did that and how did they get so good? 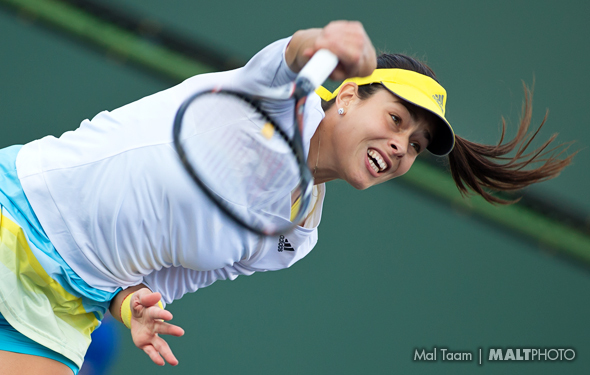 Talk about very good young players, Ivanovic will face Madison Keys in the third round. The American reached the semifinals at the Aussie Open last year, and right after that, it looked like Keys would jump into the top 10. But she was spotty for the rest of the year. She played excellent ball to reach the final at Charleston, and reach the quarters at Wimbledon, but after that, she was very inconsistent. She is a huge hitter, but she can become frustrated. Perhaps this season, she will be calmer. Ivanovic will find out on Saturday. Victoria Azarenka is playing fantastic, winning Brisbane and then crushing two players at the AO. On Thursday she blew apart Danka Kovinic 6-1 6-2. The No. 3 Garbine Muguruza played so-so but beat Kirsten Flipkens 6-4 6-2. The pressure is on for the young Spaniard and could struggle against Barbora Strycova. The American Varvara Lepchenko beat Lara Arruabarrena 7-6(7) 6-4 and she does have a real chance to reach the fourth round when she faces Zhang Shuai, even though the Chinese did play very well to upset Simona Halep and Cornet. Andy Murray hit six beautiful lob winners in the first set over Sam Groth 6-0 6-4 6-1. Groth is tall and he constantly comes into the net, but even though he would try to climb way up in the sky he couldn’t touch him. The American John Isner was pretty consistent and smart to beat Marcel Granollers 6-3 7-6(6) 7-6(2). His backhand really has improved over the past year, but now he will have to face Feliciano Lopez, who overcame Guido Pella 7-6(2) 6-7(4) 7-6(3) 6-7(8) 6-4 in a marathon. Back in 2012 at the Aussie Open, Lopez beat Isner 6-3 6-7(3) 6-4 6-7(0) 6-1 in the third round. At the 2014 Wimbledon, the Spaniard beat Isner 6-7(8) 7-6(6) 7-6(3) 7-5. The lefty bothers him. But fortunately, Isner defeated Lopez 7-6(5) 6-7(9) 7-6(4) in Queens last year. Maybe he can turn the tables. Here is another big contest on Saturday, when the Brisbane winner Milos Raonic will go up against the Sydney winner Viktor Troicki. On Thursday, Raonic beat Tommy Robredo 7-6(6) 7-6(5) 7-5, while Troicki beat Tim Smyczek 6-4 7-6(5) 7-6(4). Both are confident, but the Serbian must be a little tired. Another American, Steve Johnson beat Thomaz Bellucci 6-3 6-2 6-2 and will play David Ferrer. Johnson knows they could be on court for hours and hours. AUSTRALIAN OPEN, January 20, 2016 – Admittedly, Novak Djokovic had a tremendous year in 2015. He won 11 titles, including three majors, grabbing the Australian Open, Wimbledon and the US Open. He beat the rest of the so-called Big Boy-plus 1: Roger Federer, Rafael Nadal, Andy Murray and Stan Wawrinka. Federer has won 17 Grand Slams and Nadal has won 14 majors. Djokovic ‘only’ has won 10 Grand Slams. Both Murray and Wawrinka have won two Grand Slams, which is pretty good, too. Some think that the Big 4 plus 1 might have begun to disappear because in 2015, no one could handle Djokovic for the most part. “If you’re looking at his season, he was the most dominant player by far last year,” said Federer, who took out Alexandr Dolgopolov 6-3 7-5 6-1 in the second round. “Then, if you look at just who won the Slams and the Masters 1000s, doesn’t hold truth, because Stan won the French [he beat Djokovic in the final]. Nobody else won a Slam other than him and Novak. So it completely depends on how you look at it. Who’s had the most success? The top five guys really, with Stan, Murray, myself, Novak and Rafa. Federer is now 34 years old, just like the Aussie Lleyton Hewitt, who will retire after the tournament is over. They began playing each other in 1998, when they were still juniors. Within a flash, Hewitt was given a wild card in his own town, Adelaide, and he won the title. Federer and Hewitt were supposed to play doubles in the juniors at the Australian Open, but instead, Hewitt was given another wild card, this time in the pros. “He dumped me,” Federer said with a laugh. For the next five years, Hewitt pretty much had him, winning seven contests and losing two matches. The small yet feisty Aussie beat Federer on carpet, grass and hard courts. But, by 2004, Federer had risen. He had finally figured him out. They had yet to face off in the majors, but this time, Federer and Hewitt went at each other in the Australian Open and Wimbledon. Federer was completely in control. He understood exactly how he should play Hewitt. The Swiss beat the Aussie 15 matches in a row, until 2010, when Hewitt finally upset him on grass in Halle. In 2014, Hewitt was absolutely thrilled, upending Federer in the final in Brisbane. The only time they had played against each other in Australia was in the Davis Cup in 2003, when the two-time Grand Slam champion Hewitt came back down two sets on grass. Both of them still clearly recalls what occurred. It would be stunning if they can meet in the http://www.cialisgeneriquefr24.com/acheter-cialis-forum/ final of the 2016 Australian Open. They are in opposite draws and Hewitt hasn’t played the singles since the US Open. But both have said they will watch each other’s matches during the tournament. They admire each other quite well. 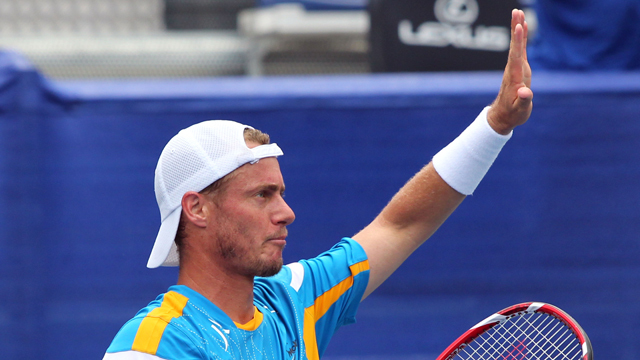 Hewitt will face David Ferrer in the second round on Rod Laver. The Aussie is the underdog, but if he is healthy, they can exchange long rallies all night long. Federer will go up against Grigor Dimitrov in the third round. The two just played in Brisbane, with Federer playing a little smart and he won it in three tight sets. The only way that Dimitrov can win is to move forward, takes some risks and he cannot back off. The Bulgarian looks a little bit better after a tough year. Last week in Sydney, he reached the final, he held a match point versus Victor Troicki, he came up the net, he had an easy forehand down the line and he dumped it. He lost and he was crushed. Can he stun Federer? Possibly, but if he has a match-point, he cannot hesitate. Here are two excellent third-round matches: Tomas Berdych vs. Nick Kyrgios and David Goffin vs. Dominic Thiem.